The Elton Derby is our original product. Being a competitive game it generates a great deal of excitement for player and spectators alike. 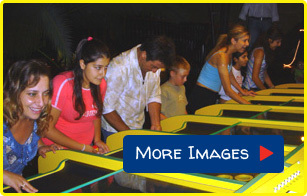 This ever popular competitive group game has won awards and licenses worldwide. Derby prices start from GB£ 2500 per lane so a typical 9 player Derby is just GB£ 22,500 ex works. Welcome to Elton Amusements, home of the world’s most popular group games.